I always tell people that I am not much of a gadget girl… I’m really not. Usually I find something that works and I just stick with it. I have had the same beloved Bernina machine since I became serious about quilting and I still use it every single day and still love it like I did the first day I bought it. I am completely committed to my rulers, cutters and mats and I don’t feel the need to go looking for new ones very often. However, the same cannot be said of thread. When I first started sewing, I used the cheap chain store brand that many of you probably did. I then switched to the standard ones I found at my quilt store and I thought everything was fine. 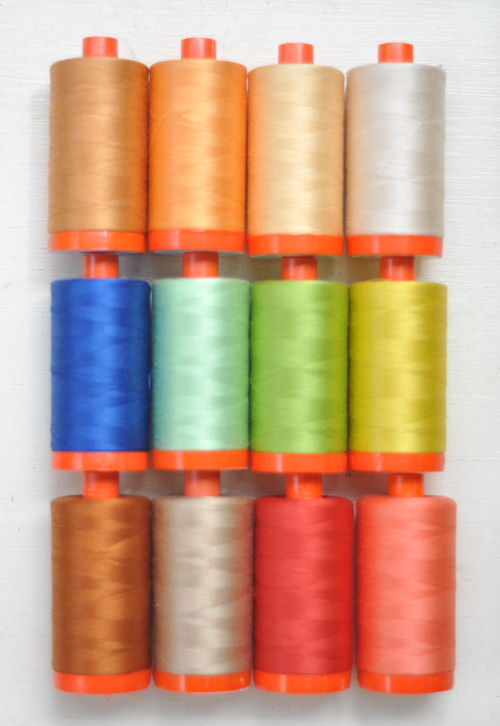 Until the day I met Aurifil thread. Hello! I decided to give it a try since several of my friends seemed so adamant about how great it was. Oh my goodness, I fell in love with it in the first stitch. I loved how it felt, how it looked, how nicely it behaved in the machine and most importantly how little lint it produced in my machine. I have never used another brand since that day, not for piecing or quilting or sewing. I love it. Really love it. 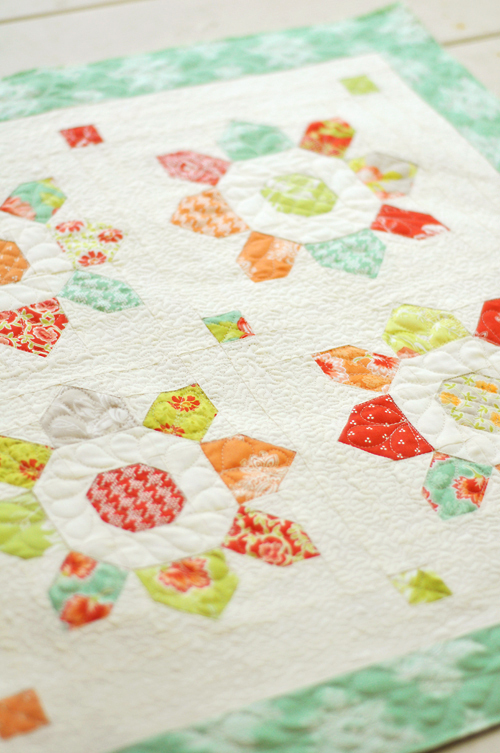 So when the opportunity presented itself to work with Aurifil, it was a total no brainer. The hardest part was choosing – or more accurately eliminating- colors to choose the final 12 that would go into my FIG TREE COLLECTION. As many of you might know, I am crazy about color and I have so many favorite “Fig Tree” colors that it was really, really hard eliminating some of my favorites in order to have the final 12 that would go into the box! Of course I am in love with the grouping that I ended up with. 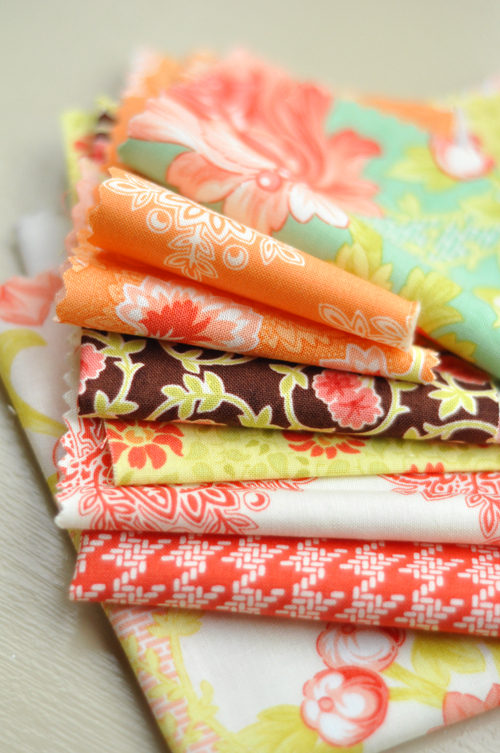 It just makes me want to sew every time I open the box and look at all that color yumminess in one place!! And then there was more! As an extra project, I got to do something even more fun. Or at least equally fun !! The idea was born to make a little Fig Tree/MODA/Aurifil kit. What could possibly be better? It would include 7 threads, 1 mini charm and a free pattern. I went to work! This was a bit easier than choosing the main color collection since the colors had to coordinate with my upcoming SOMERSET collection. Once I had the thread colors and the Somerset Mini Charm, the free pattern came to me almost automatically… of course they had to be spools! So I settled on two different spool shapes and went to cutting! 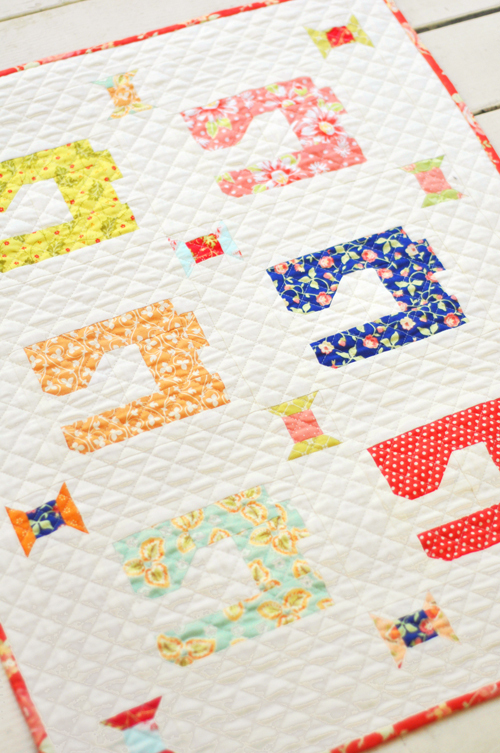 I added several of the colors of thread for the quilting itself too! Not sure if you can see that on the monitor but its there, I promise! 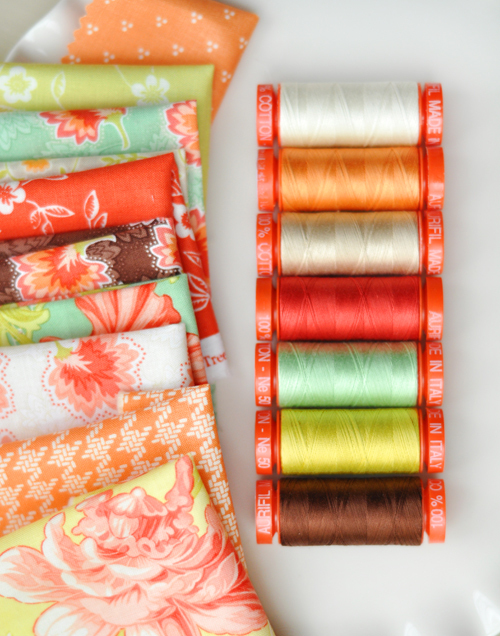 So here is our little piece of fabric and thread heaven… “MY AURIFIL SPOOLS” made with Aurifil thread and SOMERSET fabric by Fig Tree for MODA! 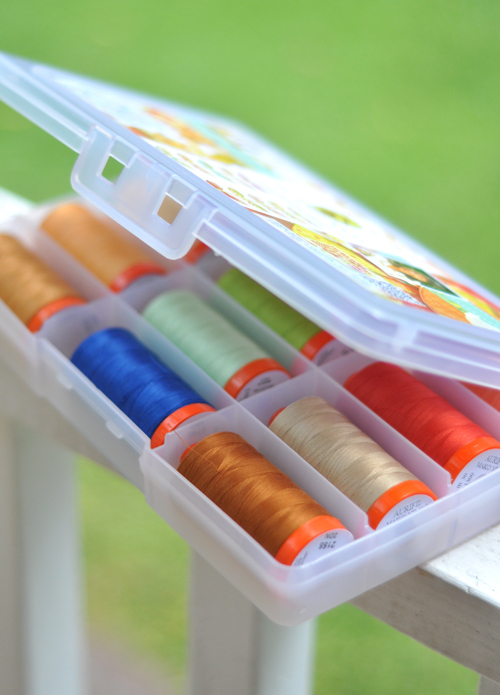 All in one sweet little box, it is the perfect little kit for you to enjoy or as a surprise for your favorite sewing friend! Although once you have one, I am not sure how you would ever give it away LOL! Kit boxes will be available in September as will the entire Somerset line! As soon as we finished putting this little project together, I decided that we wanted to do a special contest and promotion with it! We want all of you to join in the fun! It is a great chance to play around with a little design of your own and win some amazing prizes at the same time! 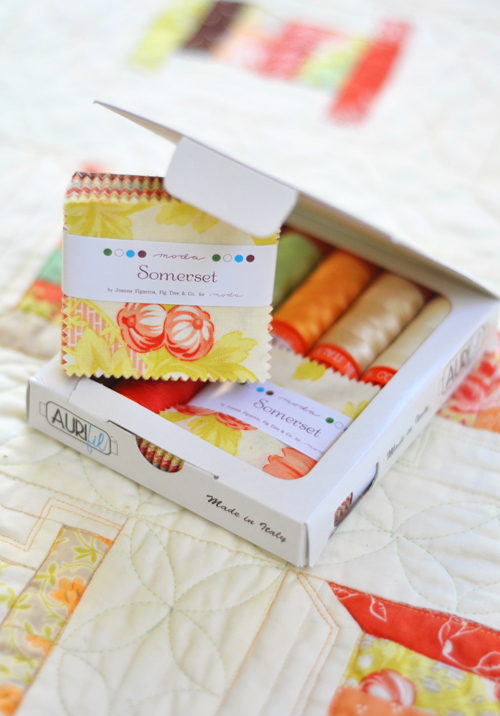 WHAT: A contest using the new Somerset Thread Box by Fig Tree & Co. for AURIFIL. Using the fabric and thread goodies in the box, design your own original mini charm pattern and submit it to us to win fabulous prizes! 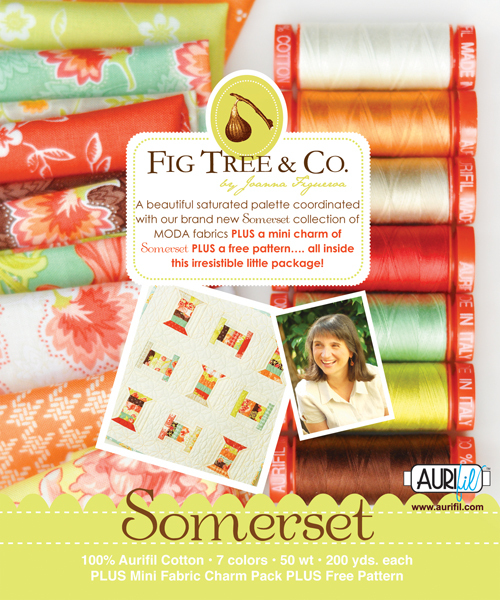 Winners will receive a fat eighth bundle of our upcoming SOMERSET line, a packet of our brand new patterns, Fig Tree nail polish and Fig Tree Fabric Spray by Soak! If possible, we may even publish your pattern! 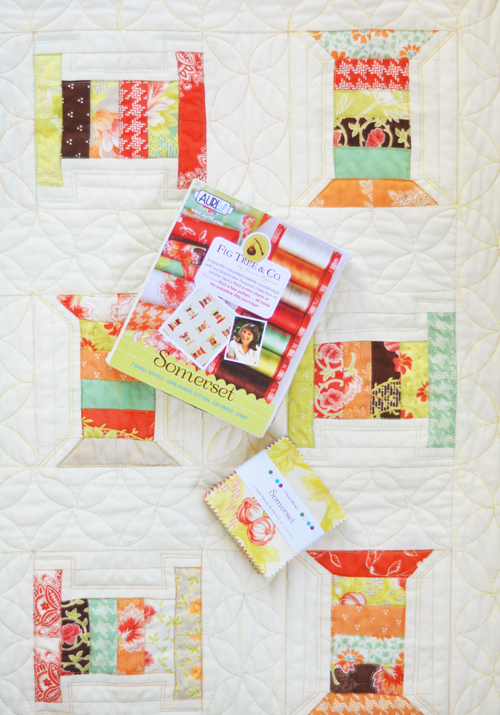 WHEN: Submit a photo of your quilt with a story of your inspiration and how you used the mini charm and the Somerset threads by November 30, 2014. You can reserve a kit HERE or click HERE for more info on the contest itself! 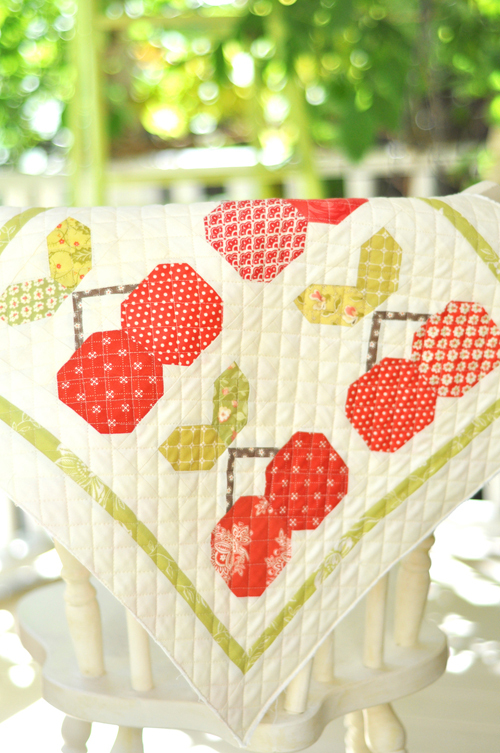 … our full size version of CANNED PEARS is also available as a pattern. 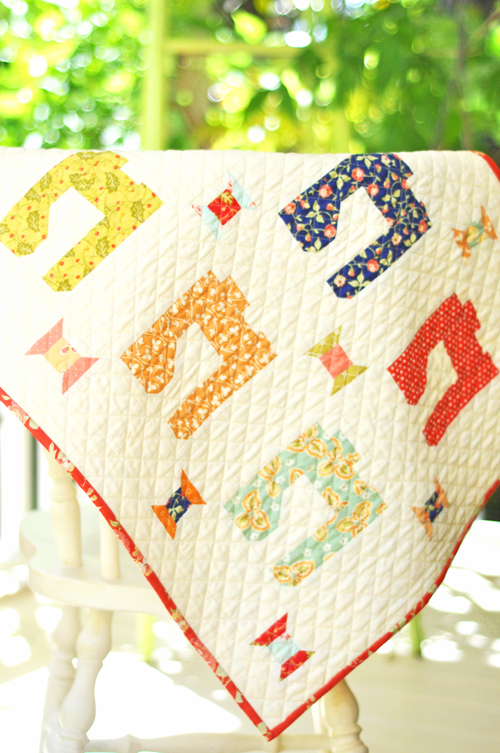 … the original size of this pattern is from our WITH FABRIC & THREAD book and comes in both scrappy and 2-color version so we used both in our MINI too! … the full size CHERRY PIE is also a stand alone Fig Tree pattern. … there is no full size pattern of STITCH yet, coming soon! As we speak, we are working on yet more new MINIS as well… because, well we are just a little bit addicted. Because they are a little bit addictive! If you want to follow along and see what other folks are doing with our MINIS, the best place to do that is to follow us on INSTAGRAM. We are figtreeandco. Or come see me on my blog, Fresh Figs anytime. Izzy, I think what is so great about the sewing community and products available to us is the vast array of options we have, how blessed are we. 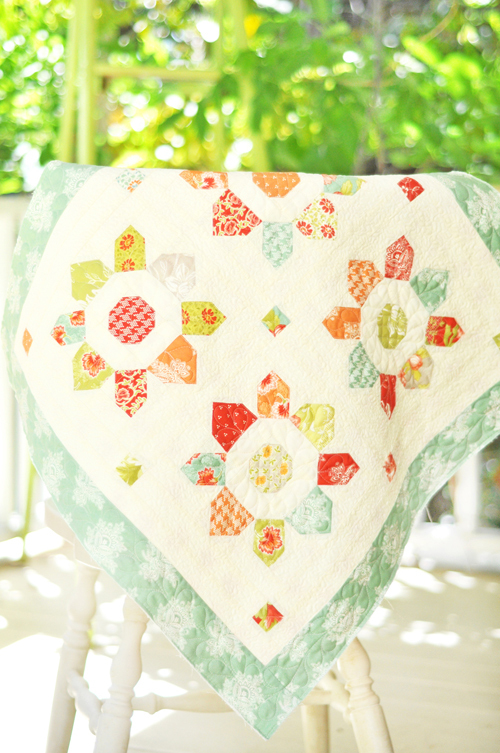 I personally love Aurifil for machine piecing. I do not use it for garmet or when making bags as I like a thread that is more substantial. It is not necessary to jump on this band wagon but how lovely to watch all the wagons go by and then decide which one is perfect for us. thanks Sandy for that lovely reply! You are very sweet! So very glad you like it. We think its pretty awesome :-)! 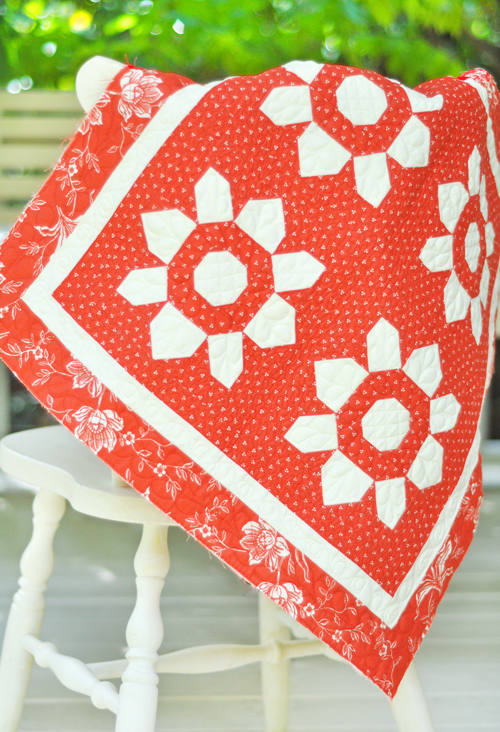 I love your quilts and the Fig Tree fabric is to die for! 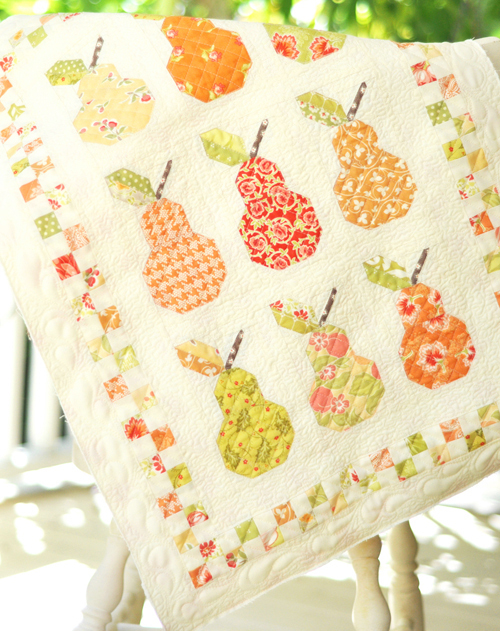 Especially love the mini pears quilt!!! That said, unfortunately I can’t share your enthusiasm for Aurifil thread; it may be the best thread ever, but I still can’t bring myself to use it and therefore condone Aurifil and Alex’s sexist and misogynist advertising. 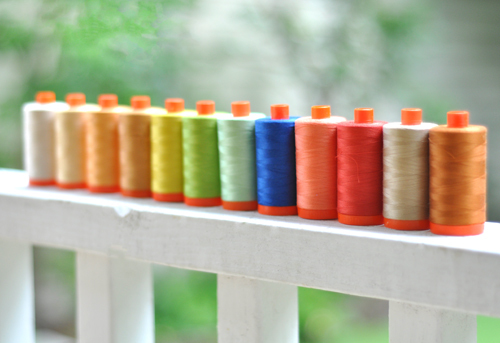 I’d rather use a less superior thread (if they really even are…) than, with my buy, tell Aurifil and millions of women, young girls (and men and young boys!) that Aurifil’s advertising is OK. To those who would wish to separate our hobbies and our politics: who we choose to support through our consumer decisions IS a political issue and it won’t stop being one just because we want it to be. I’ll admit that I was unaware of Aurifil’s sexist advertising until just recently; maybe you also haven’t seen it yet? Check out their #heygirl and #aurigirl campaigns on twitter to get an idea (or @alexveronelli in general). Thanks so much. They are all of our favorite in one little box!